Home / Business - Design - Inspiration - Marketing Outlets - Marketing Strategy - Understanding Customers / Is Print Media Dead? As we draw 2018 to a close one question on everyone’s mind is what will the new year bring? What advancements in technology will be made? Will we drive flying cars? (finally?). With the newest gadgets, able to do everything our hearts desire, it can be hard to remember the last time you read a physical book, magazine or (gulp!) newspaper. Print media is becoming almost nostalgic (like Stranger Things but sadder). 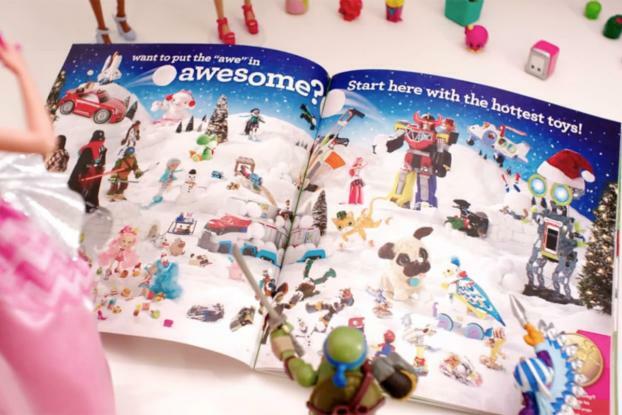 So much so, that Amazon plans to print a Christmas toy catalog this year to be mailed and be distributed through Whole Foods (Amazon owns that too). If a company like Amazon who cannot function without its loyal web-based customers, sees the value of thick, glossy pages full of Legos and bicycles, is print really dead? The answer is yes and no. There is still a place for print media – which will be outlined below – but it will take on new life by partnering with digital by providing a physical presence in an increasingly intangible world. “According to research, 56 percent of customers feel they can trust print marketing more than other types of marketing.” In fact, research show over half of customers still read snail mail and make purchasing decisions based on those campaigns. Whether the idea is based in fact or not, print is thought of as trustworthy and reliable in a world of full of click bait and “alternate facts.” We have hit on another huge advantage of print media – it disrupts the stream of advertisements constantly flowing to us from our phones, laptops, televisions and even walking around town. Being handed a printed flyer for a new store opening for example, forces us to look up from our phones and decide if we want to check it out later or scrutinize their choice of font (just me?). We are consistently becoming immune to the guerilla marketing efforts all around us. Small businesses can profit the most from print media because it allows them to target their perfect potential customer. Hearst Bay Area’s Marketing blog gives us a perfect example, “dog lovers that want to purchase healthy food for their canine friends are more likely to find the right brand via a publication such as Dog Fancy than by receiving an email blast from an online marketing agency.” Remember when we all used to wait as our computers connected to the internet (unless someone was on the phone!) and stared intently at the mail icon for that magic, “one unread message”? Those were the days! But we can agree that no one is quite as eager to check their inboxes these days. It takes a very targeted, specific email for us to stop and read what’s inside. The same can be said for print marketing. With some research, small businesses can narrow down which publications cater to their audience, where their customers live, and the types of products they like. This will help make informed decisions about where to place their print dollars moving forward. Some of the most effective campaigns provide a seamless experience from platform to platform. Brands like Volkswagen, Ikea and Motorola have used emerging technologies like virtual reality to make a two-dimensional advertisement come to life with an interactive component. Campaigns that jump off the page, (metaphorically of course, literally would be terrifying), are the most effective. The best ads encourage us to go online for more content, creating a truly immersive experience. Creating a blended campaign will also help keeps costs low because, print only campaigns will become cost prohibitive and will take more time to produce. In a world of automation and tools that help us edit quickly without much cost, mass printing is outdated. Ever made a mistake and caused your company another print run? Did they make you sit in the corner? You can see why companies stand to lose if they solely depend on print to reach their customers. The bottom line is this – if you are having to choose between print and digital because of your budget, go digital. Digital still has the highest ROI (return on investment) and the highest customer conversion rates. Not to mention you won’t have the added cost of printing and production. But, if you have the budget, use both! As you are planning promotions and campaigns take time to consider the best way to spread your message. You will find when both mediums work in tandem, your campaign will stand out as memorable and accessible to your audience. Just don’t forget to recycle! ← How Can I Use LinkedIn to Grow My Business?